1. Tell us a little about Starship Pediatric Dentistry. 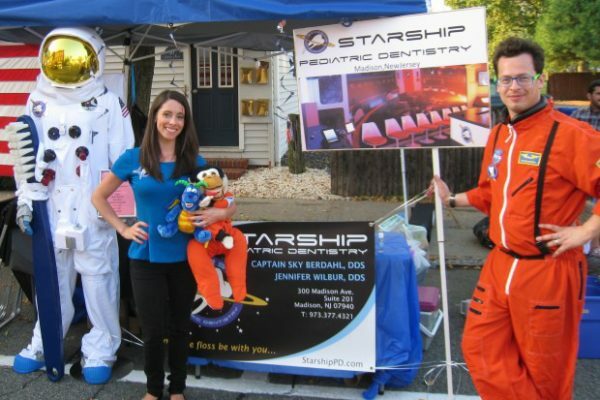 Starship Pediatric Dentistry is a fully pediatric focused dental office in Madison, New Jersey. It was started by Doctors Jen Wilbur and Sky Berdahl in July of 2013. In case you are unfamiliar with our office, we have frequently heard ourselves referred to as the “Spaceship Dentist.” That is of course because our office is set up like a spaceship. We want visiting our office to be a fun experience, rather than one that causes children stress. So frequently, kids walk in to a medical waiting room and immediately feel anxiety, sometimes to a point that is hard to overcome. We designed our office with a space theme so that when children enter, they are immediately excited by their surroundings. 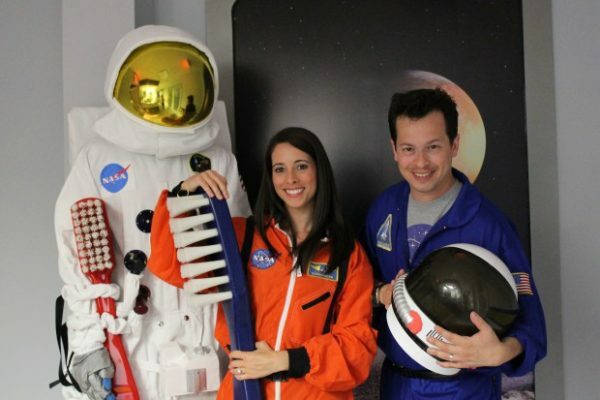 They take a picture with our spaceman, pick prizes, request what movie they want to watch, all with the goal of keeping them relaxed for the important part - the dental treatment. Once the kids are in the treatment rooms, they can pick their toothpaste flavors and toothbrush, they are encouraged to touch and feel all of the instruments, ask questions, and practice brushing on our dental animals. When the children understand what will be done, they usually do a great job, all the while having their eyes set upon what they think is the most important thing – their prize. 2. When did you start out and what is your philosophy. Although the dream of Starship Pediatric Dentistry has been in the works for many years, we only first opened our doors in July 2013. Our philosophy is fairly simple. We want to provide our patients with the absolute best care in a fun and stress-free environment and we always treat our patients and their families as we would want to be treated. We also place a lot of emphasis on prevention and education. We try to create wonderful lifelong dental patients and inspire the children to take great care of their mouths. We have found that if we provide excellent care and try to have fun with our patients throughout the day, then everything else falls into place. 3. What made you decide to open a children’s dental practice. Dr. Sky knew he wanted to be a pediatric dentist from a very early age. After an accidental trauma to his front teeth, he spent many hours with his own pediatric dentist, and his future was sealed. Dr. Jen always knew that she wanted to work with children. If you had asked her in high school she would have told you she wanted to be a kindergarten teacher, pediatric nutritionist, pediatrician, or pediatric dentist (can you see the pattern?). She decided upon pediatric dentistry during college and could not be happier with her choice! While some pediatric dentists work within multi-specialty offices, Drs. Jen and Sky wanted to create a fully child focused experience at Starship. Many children enter a medical office and have immediate anxiety from simply sitting in the waiting room. We wanted our waiting room to be a fun and interactive experience. From our iPads, toys, books, sound effects, and décor, we have tried to make visiting our waiting room an exciting event. In our treatment rooms, optional televisions provide great distraction if a child is nervous about treatment. Each design detail was carefully selected by Dr. Sky in hopes of creating an awesome experience for all of the patients. 4. Please tell us a little about the services you provide. Starship Pediatric Dentistry is a full service pediatric dental office, providing all treatment needs to infants, toddlers, children, adolescents, teens, and patients with special needs. Our services include, but are not limited to providing check-ups, cleanings, fluoride treatment, radiographs, oral hygiene instruction, alternate preventive care, fillings and restorative treatments for cavities, sealants, extractions, space maintenance, and emergency exams. If necessary, treatment can be completed with nitrous oxide (“laughing gas”) or in the operative room at Morristown Memorial. 5. What is the best part about owning a local business in Madison? Owning a business in Madison is wonderful. We especially loved being a part of Bottle Hill Day for the past two years. For those people who are not familiar with it, Bottle Hill Day is a huge town street fair that is held in downtown Madison in the early fall. For the past two years, Starship has had a booth at Bottle Hill. We even bring our astronaut, Mr. NASA, to help us hand out toothbrushes. We loved getting to see all of our local patients their families and having the chance to meet so many new families as well. 6. What is your advice to people who want to start their own business? Opening your own business is wonderful. However, as we have all heard our parents and grandparents say, nothing worthwhile in life is ever easy. When you own your own business, you will work nights, you will work weekends, you will miss out on things you wanted to do, you will want to call out sick and not be able to, and you will have to give up a lot to get where you want to be. In the end, it will all be worth it. To build something of your own is an amazing thing. If you are willing to work, go for it! You will be happy you did. Don’t forget that the American Academy of Pediatrics and American Academy of Pediatric Dentistry recommends that children have their first dental visit by 12 months old. Many dental problems can be prevented by education and an early start. If you have any questions or need any tips, let us know.